Piers Anthony is a prolific author. He often cranks out three books in a year. Among his many products is a series of Young Adult fantasy novels set in the land of Xanth, where magic controls nearly everything. Anthony published the first book in the series, 'A Spell for Chameleon,' in 1977 and he's still producing them. He's currently writing the thirty-ninth book in the series. I've read books one through five and book seven, and have been consistently entertained by each new installment. You don't need to read them in sequence--each book stands alone--but it helps a little, since they are chronological, and later books do refer to elements of the plots of earlier ones. 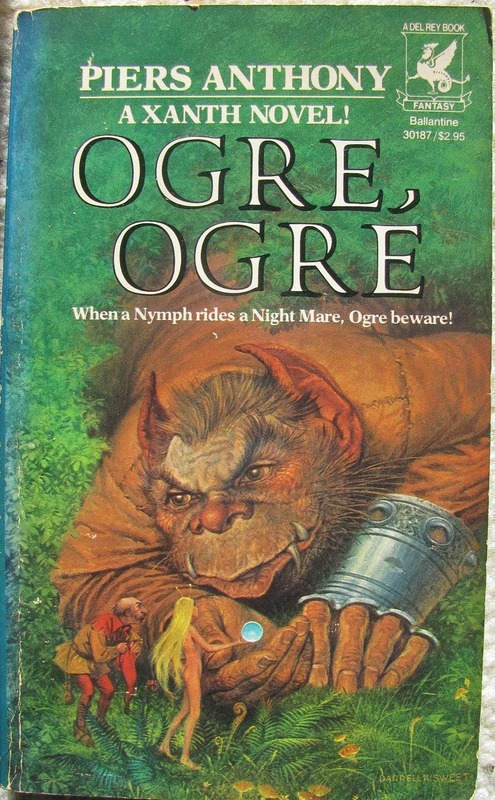 This is the fifth book in Piers Anthony's Xanth series and the best of those first five by a wide margin. Piers Anthony has a quirky, almost clunky way of unfolding a story, but the deeper structure--the skeleton of his tales--is always sound and well imagined. Some story ideas just naturally stand out or resonate more than others, and this one did. Surely that's why it was the only one of the 30+ Xanth books to get on the New York Times Best Sellers list. Ogre, Ogre is a classic 'beauty and the beast' love story. Smash is half human, half big ugly brutish Ogre. He entirely denies his human side. Tandy is half human, half nymph. Smash feels that something is missing from his life, but has no idea what. Tandy is desperately trying to escape the unwanted physical attentions of a demon who can pass through walls. Their very different quests find common ground when the Good Magician Humphrey sends them out into the wilds of Xanth together to seek their 'answers'. Along the way Smash takes six more female creatures in tow, all of whom also have unfulfilled needs. He fights a dragon and encounters numerous other threats and obstacles, ultimately delivering all six females safely to their various resolutions, one at a time. In the end, it's just Smash and Tandy again, and Smash still hasn't figured out what he's looking for. Of course the reader well knows what's going to happen long before it does, and yet the plot isn't spoiled by the knowing. The reader still wants to find out how and where the 'light bulb' will finally come on. As in all of the Xanth novels up to this point, the hurdles, obstacles, threats and conflicts that the protagonists encounter come thick and fast, one after another, almost always in series. That is, they come one at a time and are essentially dispatched or set aside before the next one arises. In that very general sense the story lines are predictable and simple--there's an over-riding quest and a lot of short-lived impediments to achieving the goal. In most cases there's absolutely no foreshadowing - the majority of the problems arise entirely unexpected, and more often than not they are forgotten just as quickly, unless some lesson has been imparted. This simple writing style, I'd guess, can appeal to readers who are quite young, and not a lot of brain power is required to enjoy the tale. Yet I, as a mature adult didn't feel that my intelligence was insulted, nor was I ever bored. Anthony is good at what he does, and the quality is consistent. It's good light entertainment. "There is trouble in Xanth again. The Gap Dragon had escaped and was ravaging across the land, the forget-spell was causing mass amnesia, three-year old Ivy was headed right for a hungry dragon. Could things get any worse? Probably...."
Yes, the forget-spell has also escaped and had dissipated into 'forget whorls.' It was these that were causing the random events of amnesia all over civilized Xanth. Little Ivy is the daughter of Xanth's ruling King Dor and his wife Irene, and a forget whorl has passed through, causing Ivy to be separated from her parents. This sets up the plot: Princess Irene is on a quest to rescue her 'helpless' daughter. But out in the deepest wilds of Xanth little Ivy is managing to take care of herself by innocently wielding her Magician-Grade magical talent. She's not nearly as helpless as her mother might believe. Piers Anthony's seventh Xanth book, 'Dragon on a Pedestal,' follows the parallel adventures of both Ivy and her mother as they seek to reunite. The author alternates chapters from the point of view of mother and daughter. As the pages turn, Anthony unveils challenge after challenge for both protagonists, always unexpected, almost never foreshadowed, and usually quite imaginative. And as usual with the Xanth series, these challenges appear and are dispatched mostly in serial order. 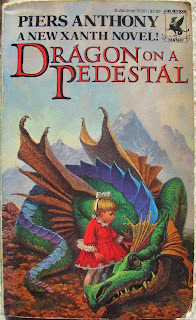 As the book comes to its climax a deadly threat to all of Xanth, which has lain dormant for thirty years, provides the focus for a satisfying denouement. 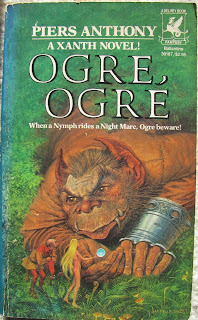 As usual for the Xanth series, Anthony trots out a 'passel' of puns, reinforces his quaint and benignly sexist perspectives on the male/female divide, and builds his plot like a 'road-movie.' By this I mean that constant travel is involved from beginning to end, all the tension and conflict raised in the plot come from unexpected encounters along the way, and the denouement always involves (at least in part) reaching a destination. And as always Anthony delivers an entertaining and imaginative story. These are no literary masterpieces. They're not far from the 'Harlequin Romances' in terms of the quality of the prose. They're 'light fantasy' targeted at young adults. And for me that's just fine: they offer me a chance to sit back, relax and enjoy a rollicking roller-coaster ride.